Yeah, I’ve also been checking Surge out recently, and it’s pretty interesting! For those who don’t know, this was a formerly commercial synth that’s been around for a while, and the author recently open sourced it because they no longer had time to develop it. 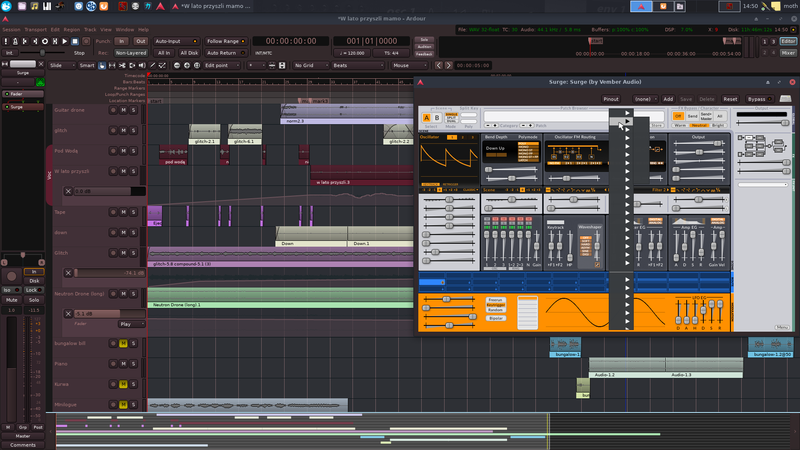 The linux port does still seem to be WIP and has some issues, some of which are displayed in that video—like Ardour doesn’t list it as an instrument and you need to set the track to flexible I/O (or manually connect the outputs). It’s also only available as VST, and I did have a couple crashes (when rapidly changing presets while testing it). I also had to install a library that wasn’t available in the Debian repos to get it to work (libxcb-util1, if anyone else happens to run into the same issue). But overall it seems to function, sounds fairly decent, comes with a decent number of presets, and has some pretty cool modulation options! Oh, is the xcb util still a thing? I thought I had fixed that? Yeah, I tried again with the most recent nightly build of Surge, and I can’t get it to work without installing libxcb-util1. With the libxcb-util0 version provided by Debian, Ardour just blacklists the plugin when scanning VSTs. Unfortunately I have like a lot of missing text. Basically all the drop down menus display no text at all. Most of the fader’s labels are also blank. I got the same error / warning installing that AUR package, but it seems to still work correctly for me, just fyi! I’ve got exactly the same kind of issues with Surge in Carla (stand alone) - no labels, no text in menus. I tried to launch ardour from terminal and see what happens when Surge is loaded. So clearly there are some missing elements. Do you guys have these warnings too? Using the VST plugin on Debian testing (nightly build 2019-04-06-debd603, installed from the .deb package available at the website), I get the same messages roithamer quoted, but text works fine and I don’t see anything obvious missing. Thank you for information. I’ll try to investigate further. W…Wait I’m confused What link? The register timer stuff is indeed debug messages. The link I requested was to the aur package but I’ve already found it. The aur package takes the debian package and converts it to arch. I don’t know enough about that but if it works it works. If not, then I’m not surprised.